In Extremis has skillfully eluded me for going on three years now. It was made by a little French house named Blue Sphere, with a scant four titles to their name. I don’t remember where or when I picked it up. A combination of obscure developer and obscure game meant that no one really bothered to store any information about it. Its only real claim to fame is ripping off assets from Alien (which it does, brazenly, but we’ll save that for later). The French version’s been on abandonware sites for years, but the English version, and its documentation, has fallen off the face of the Earth. So after some ham-fisted Babelfish time with a newly-discovered French manual, and a few days of good old experimenting, I’m ready to present to you what is probably the only in-depth review you will ever read for In Extremis. You’ll find remains of the crew scattered around the ship. The plot is typical sci-fi fare. You’re the pilot of a patrol craft. The important little part that prevents your ship from exploding suffers a sudden, catastrophic failure. Your only option is to bail out and stow away on the creepy science vessel adrift nearby. Now you’re stuck, alone, on an infested ship with nowhere to go but further in. It looks like Doom, smells like Event Horizon, but predates both. And truthfully, the gameplay is standard FPS. But it’s the little survival horror elements that caused my curiosity to perk up and start taking notes. First off, there are plenty of aliens and barely enough ammo. None of your weapons can be reloaded, and you can only carry one at a time, so finding and rationing your next weapon is pretty critical. Second, your oxygen is always steadily depleting (marked by a green bar on your HUD). There are no “refill stations” or anything similar, so you have to fanatically seek out new oxygen tanks. When you find a reserve tank, it will sit in your inventory until you manually swap them out (your view does a neat, slow fade to white to simulate lightheadedness when your current tank goes dry). However, the tank you pick up won’t usually be full, so finding new oxygen is never far from your mind. Similarly, there are batteries you can find to power a radar on your HUD, or a set of night-vision goggles. Running either drains power, and carefree use could leave you in the dark (hyuk hyuk) when you need them the most. Type out the code to proceed. The key hunt is still a prominent feature, but with a decent twist. You’ll find command cards as you progress. 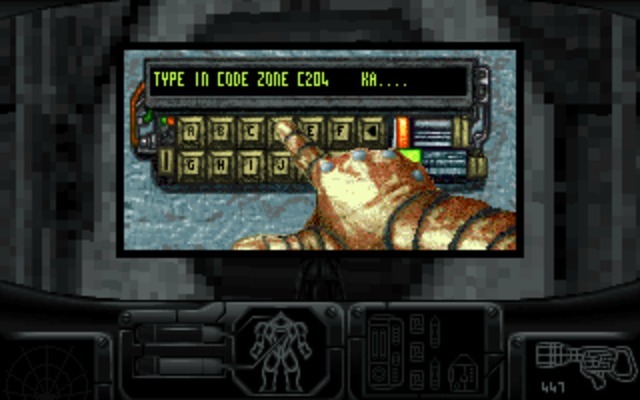 Command cards are inserted into special terminals on every level, which (if the card is valid for that level) will display a code for the current level and the next. Those codes are used to open up lockers, complete with a nifty hand interface where you manually punch the numbers in. Lockers provide you with guns, inventory items, and the occasional new card. Repeat the process down the line, including a separate set of elevator cards to open up new levels. You can only carry three cards at a time, so as you swap old cards with new ones, you lose access to previous levels while opening new areas of the ship. Don’t worry though. Shooting there will be. 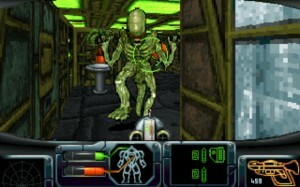 Each level is populated by one of a few sets of alien foes. Most are vaguely humanoid and about your height. Some are stouter, forcing you to crouch to hit them. Some, like the worms or ceiling-walkers, move erratically and force you to be careful with your aim or risk wasting ammo. All the aliens have the same basic AI. They will charge once you get within an activation range, opening doors and navigating corners if needed. Difficulty is only measured by their resistance to your current gun – enemies get tougher as you progress further and find better weapons. However, they do display some very basic intelligence and will sometimes retreat around corners if they can’t close to biting/clawing range without taking an excess of gunfire. It’s actually sort of a clever move, and forces you to cautiously go after them. Guns will always shoot little pockets of energy, but some will have automatic fire, one goes back to semi-auto while shooting out bolts of plasma that crackle around hit enemies, and the best has full-auto super-powered lasers. They’re a bit similar overall, but certainly increase in power as you go down the list. All enemies splatter in large explosions of teeth (you’ll see), and leave dripping goo on your visor at close range. 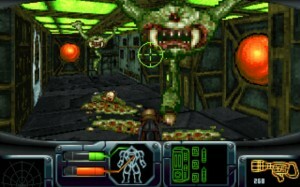 Most levels feature a set number of pre-placed baddies. A few will feature hives (actually, they look like the ends of large pipes) that act as fixed spawn points for an endless stream of additional foes. These levels will test both your ammo and your resolve, because you’re fighting at almost every moment. As you kill one, the next is coming through a door, plus the static baddies that are in the room already. If you trace (and blast) them all the way back to the spawn, you can blow it closed with a bomb found in lockers and held in your inventory. You’ll plant it, have ten seconds to run, and then enjoy the aftershocks and a newly silent level. Again, pretty neat stuff, and especially for 1993. Unfortunately, the execution derails it. The difficulty is simply too extreme. Many times I entered a “hive level” but had no bomb, and couldn’t find one on the current level. There’s a chance I missed it, because the game doesn’t seem incompetent, but I simply couldn’t get past those levels without running out of ammo. Similarly, you cannot save your game. Instead, you get a password at the start of certain levels. This system works just fine, except that the passwords are fixed and unchanging – you’re not returning to your game. This manifests itself in less oxygen than you had when you hit the checkpoint, a different gun, disappearing bombs, etc. Again, it would be okay, except it doesn’t seem that you’re given the right tools to continue. Card access always matches up, but one password dropped me in a hive level with no bomb, while another swapped the gun that I had with one totally underpowered for the enemies I was facing. Ceiling crawlers make themselves tough to hit. Enemies are also a bit unfair. All can only attack at close range, giving you a theoretical chance to kill them first, but the level’s sharp corners and your sluggish movement (replicating a space suit, I guess) means they can frequently get the drop on you. Each time any enemy strikes, you’ll get thrown back and up into the air. Like a Killer Instinct combo, they can easily pin you against a wall and keep you in the air indefinitely. If it’s a enemy you have to crouch to hit, you will never be able to shoot your way out of this. Hive levels are the worst. Enemies spawn so fast (sometimes in groups of two or three) than they can easily knock you back and prevent any forward progress. I was able to muscle past a line of them one time, only to have the door ahead open to admit more. They literally crowd-surfed me all the way back to start. Strangely enough, health is rarely an issue. You can find syringes that boost any amount of health back to full, and can carry two of these at a time. Most saves start you with two in your inventory. 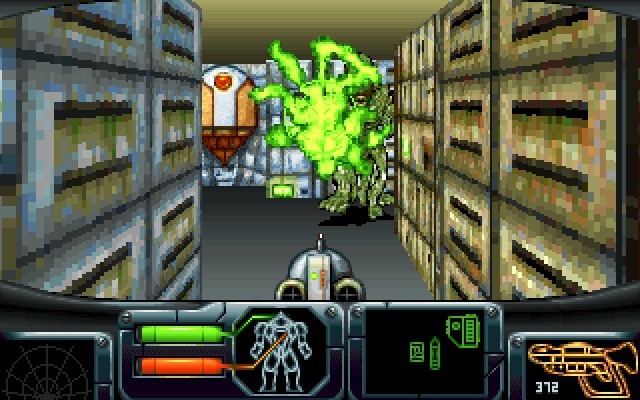 Individual enemy attacks are also surprisingly weak, and they’ll really only kill you if they can pin you in a corner. Even then, we’re talking over a minute before groups of them can wear your health out. Instead, it’s the oxygen that will kill you every time. Those bottles are the most precious and rare commodity on the ship, and they’re never, ever where you need them to be. On a rough estimate, I’d say I found five total tanks across 28+ levels of ship. You run out in about two levels of standard searching. You will end games to lack of oxygen, and there doesn’t appear to be anything you can do about it. Loading a password save will return some air to your tank, but none of the passwords give you a spare. Maybe you’re supposed to gack the first time and use the knowledge to speed run through a second time, but that doesn’t seem quite right, and you’ll still have all the enemies to deal with. Graphically, it looks sharp. The Giger biomechanical look comes across in the appropriate levels, and even the ones with panels of blinking lights look more foreboding and less Buck Rogers. There are only a few different tilesets, and they usually just cycle through them as you move down the levels, so levels do start to look like indistinct repeats. Still, the textures look good, and there’s consistency inside the levels. It’s totally unclear as to who would ever build a ship like this (it’s not supposed to be an alien vessel) but the atmosphere and some well-placed props do a nice job of being creepy in all the right places. Textured floors, ceilings, doors that open automatically as you approach, and the ability to crouch make up the important technical achievements. The engine does clunk along a bit, and turning is a little choppy, but you never feel like the engine is moving slower than your character is supposed to. Audio is limited. There’s no music, and levels are silent except for the distant clomping of your boots. I think they were going for a representation of being in a near-vacuum, but as the weapon and alien effects don’t follow this theory, maybe they were just being cheap. And as I mentioned in the beginning, every piece of audio is nicked (illegally, they say) from film or TV. You’ll recognize alarms from Star Trek. The gunshots are photon torpedoes from the same. The computer noises and all of the intro movie sounds are from Alien. There’s not so many of them that it’s a fun little “spot the illegal rip” side game, but enough that they should have been ashamed. I really wanted to like In Extremis, though I’m not sure why. I suppose because its survival horror trappings put a nice spin on the standard sci-fi FPS. Unfortunately, it doesn’t work out. Clunking along at this engine’s pace feels more boring than tense, the save system seems mostly broken, some levels are far too difficult to beat, and your dwindling oxygen is irrationally limited. I love the idea of a horror FPS, and though Blue Sphere put some admirable thought into this one, it isn’t the one to do the idea justice. NOTE – Since I doubt the availability of information for this one is going to get any easier, allow me to help out those that are still curious. You’ll need the initial code found only in the manual to get anywhere. IJEKAH will open the lockers on the first level, allowing you to get your first keycard. You can take the rest from there. More than a Doom clone. Sci-fi with a little bit of horror and inventory management. Password save system leaves you ill-equipped. Levels with spawn points a good idea, but overzealous in their spawning. Otherwise, it’d be a pretty great game if you weren’t consistently running out of oxygen faster than you can find replacements. I have been on a quest do download every DOS first-person shooter I can get my hands on: the good, the bad and the (really) ugly. As such, I grabbed this game but can not figure out the controls. I can fire with the space bar, but how do I move? I have tried both the arrow keys and the WASD set but none of them work. Am I missing something? Arrow keys should work, just tested on my end. The controls are remappable in the options menu. The game does support joysticks, so you’ll want to unplug any sticks or gamepads, else it will override the keyboard controls. If it still doesn’t work, download from a different site? Out of curiosity, did you get the French or English version? I’ve actually wanted to try this game, and my French is…passable, but not great, but I’d prefer to be able to read 100% of the text surrounding the game instead of 60-70%. English, but there’s barely any in-game text either way. Some stuff in the intro movie, and a superfluous warning here and there (you can’t do anything about the power flickering, for example). Also make sure you set your DOSBox cycles correctly, because of the extreme reliance on air. Don’t want to increase the speed at which you run out of it. Normal CPU, 5000-10000 cycles worked for me. English also. As it turns out, it was my copy that was the problem – as it was not taking the arrows keys at all. I downloaded another copy and that worked fine. Of course, I also had the problem that my turn speed was going like a bat out of hell, which did not jell well with an all too slow default movement speed (actually, the opposite of my problem with Terminator: Rampage), but your suggestion of CPU cycles corrected that problem. As for my quest, I can give you some recommendations as to what ones I think would be interesting to review (good or bad) when I am done if you would like. Sure! Obscure FPS’s are some of my favorite to write about. Alright, breaking my DOS rule, here is my first and probably most emphatic recommendation: Bad Toys/Bad Toys 3D. The games are perhaps the only first-person shooter ever made for Windows 3.1 (well, the original 1995 release, Bad Toys, targeted it, which was in black and white – but the later colourized 1998 release, Bad Toys 3D, still used 16-bit libraries). Made by the Czech developer (complete with odd English translations) Tibo Software (largely consisting of brothers Paval and Libor Valach), it is a Wolfenstein 3D clone set in a toy factory come military testing ground. Yes, you heard me right. It makes good mileage out of this absurd theme, contributing to what can actually be an often tense environment as you are hunted down by smiling plushies or bipedal plastic ducks. 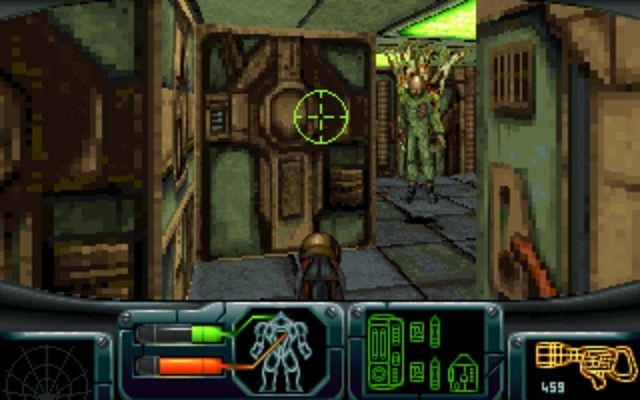 It was in fact my first ever FPS as a kid, found on those numerous old shareware compilation disks, and it terrified my brothers and I almost as much as when we first played Doom. Now that I look back on it, this was not simply a product of my youth – the game is very challenging. The combat actually feels more like Doom than Wolf3D, with each weapon having its own unique usefulness and there being more to it than simply pounding bullets into enemies. Often, for tougher enemies, I found myself strafing and running along corridors for cover. Actually, the core of the game really is the combat, as the key hunts are mitigated by the auto-map feature and somewhat formulaic level design – not that it does not have some rather creative placements for a grid-based game sometimes as well. It loves its monster closets, often triggered by opening doors or finding a key, and enemies can pop out of seemingly nowhere – this is particularly notable when I have been killed by hidden enemies whilst backtracking for ammo or health! It also uses ambient noises, and a lack of in-game music, to build up its atmosphere. It has no lighting, but makes use of wall and ceiling textures well to try and suggest it – this works better in the black-and-white version, but exists somewhat in colour as well. The (sometimes even animated) texturing is surprisingly very good and varied, more than any other Wolf3D variant I have played, and it also uses a lot of sprite props to actually make the spaces more believable than most corridor shooters. Sure the overall art-style is rather cartoonish, fitting the toy theme, but this is just part of what makes it so wacky – and can be seen as a send-up to the hand-drawn graphics of the past. It even has stars instead of blood, but before you can get away with calling it a non-violent kids game you come across the cartoon nudie posters! Yes, it really is that bizarre. My only real complaints are that the turning can be a little clunky at times (and the use function does not care in which direction you are pointing, so you can open doors with your rear – allowing you in some instances to be accidentally flanked), and that its difficulty is a little weird. There is a section of levels in the middle which are really hard, and then they get easy again before building up to the final boss battle. I would definitely say it is worth a go and perhaps a full review! I just finished it via Wine, which speaks something in of itself that I was willing to go through 25 sometimes gruelling levels – at first I thought the boss fight was comparatively easy when looking at the rest of it, but then I used the boss’s key on the exit door and saw… another boss! So it kept at me right until the end! My next recommendation for you to eventually review is the Catacomb Adventure Series. 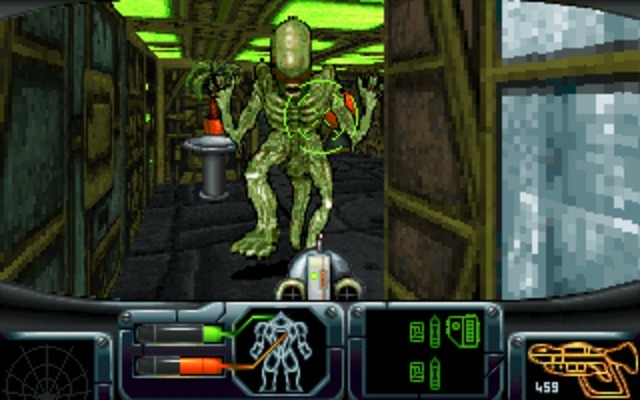 If you have looked far enough into the history of id Software you may already be aware of Catacomb 3D, but that leaves out the sequel trilogy created by Softdisk later which I feel is a story in of itself. In case you are not aware of it, however, I will get you up to speed. Catacomb was a simplistic top-down game that John Carmack (rather odd to live in a world without him at id… still I think he is genuinely better off at Occulus VR) wrote while at Softdisk for the Apple II and IBM PC, in which you played a wizard blasting monsters and, chiefly, breaking holes in the walls with magick missiles. He also wrote a sequel, Catacomb II, which was more of the same. Well, later, while at id, Carmack and the rest re-visited the concept after Carmack wrote a texture mapping system into his earlier 3D engine from Hovertank 3D, allegedly inspired by Ultima Underworld. 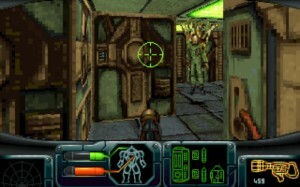 The result was Catacomb 3D, which was basically a re-creation of the earlier games in 3D first-person, right down to blasting away the block walls; it was also the first to show the player’s hand at the bottom of the screen. 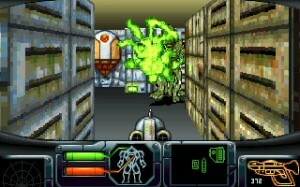 However, it does feel rather more like a tech demo for what became Wolf 3D than a proper game in its own right, which is certainly how Scott Miller saw it, and I must admit that I did not finish playing it after I reached a frustrating hub system and got tired of its repetitive grey dungeons and its one short background music track, which it shares with Commander Keen 4. Anyhow, it was soon after that id finished its contractual obligations to Softdisk (actually getting George Broussard to write a game, ScubaVenture, for them while working on Wolf), and so Softdisk was left without anyone to continue making titles for their Gamer’s Edge publication. This lead them to hire an entirely new staff to replace the departed id founders, though they built everything on the source code they left behind. This lead to sequels to both Dangerous Dave and Catacomb 3D. 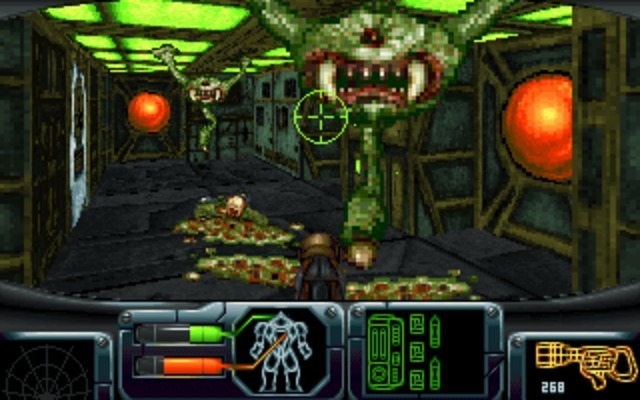 The first game, Catacomb Abyss, was released as shareware and is thus the most well known. It features the wizard character descending down into a mausoleum to face his nemesis called, well, Nemesis. None of this sounds tremendously interesting, until one actually sits down and plays it. The first few levels are grey bricked graveyards, lined with hedges and decorated with tombstones and crosses, and one at first gets the impression that this is going to be it. Then however, you descend further and the environments start to change, and you are opened to a new locale each level, from underground mines (with skeletons emerging from walls), underground crypts, temples, vaults, blazing infernos and even an aqueduct! Now, this is still just proto-Wolf3D stuck in only VGA colours, but the texture work is still far from incompetent, and is even animated in places, and the water effect is actually rather clever, even allowing monsters to “swim”. Further, this is the only game of the Wolf3D ilk I have ever seen that realized that, although you are not texturing the floors and ceilings, you can at least change the colours to suggest things – green for grass, brown for dirt, grey for stone, and so forth. The opening levels even have the dark blue sky occasionally flicker between light blue and white to simulate lighting overhead. Add in decently drawn and animated, for the time, monsters and sprites and all of this makes for what at the time must have been an incredible ‘virtual reality’ experience. The code for the final level is “CLEENEND” (yes, spelled “cleen”). That’s where the alien queen (or a frog-like critter, anyway) appears. I could not complete it then, and it seems impossible to complete now; the beast just takes in hundreds of shots and doesn’t react. …but even with this cheat on, the “queen” just takes the shots like rain drops. I think the game may simply be bugged and/or incomplete – there’s a way to walk through the wall at one point and run around the ship and the “queen”. Oh, hit “F” to trigger the floor textures on and off, by the way. I know I got to the queen, and I’m almost certain I beat her because I remember a final cutscene. I could be completely inventing this though. I thought I’d even uploaded some final boss shots to MobyGames, but apparently not. Someone could write, how to defeat Queen? I would like to thank the reviewer for bringing back such forgotten games (underdog would be probably to strong for this title). I was also intrigued by the resemblance to the Alien(s) movies, but could not know if it was intentional, a homage or a blatant rip-off (Remember, no Internet at home back then). No matter what, I recall thinking that it was an interesting game to play for any Alien(s) movie fan at the time.